I use to think life was predetermined or that we all had a fate. I had the thought process of what’s meant to be will be what’s not won’t. And although I still believe this to be true, I don’t believe it is completely true. My thought’s on life are shaped and reshaped daily. I am forever growing, changing, and evolving. This, to me, is what leads to wisdom, enlightenment, and peace. I recently had a growth spurt, and my view on life shifted. 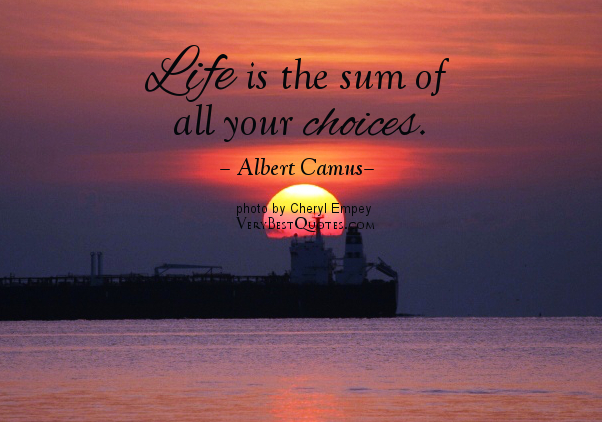 I have come to believe that life is simply several choices being played out in reality. Each choice that I make leads to another set of choices, that ultimately leads to my reality. Think of it as a movie, choices is the script, life is the movie, and you are the director, The director writes the script and the script determines the movie. 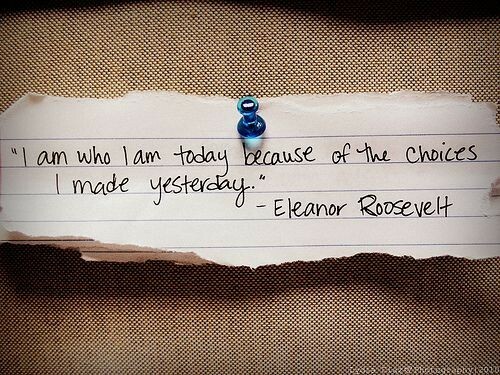 You make the choices and the choices determine your life. I recently read the book The Other Wes Moore. It was a well written and fascinating story about two young men who share the same name, similar backgrounds, grew up in similar neighborhoods, yet one is serving a life sentence in prison while the other one was a Rhodes Scholar. While reading this book, it was interesting to see how each one of their choices lead them to their current realities. They were each faced with several life changing choices and their decisions shaped their fate. You often hear people say, “I was dealt a bad hand” this saying holds truth. There are many people who are simply dealt a bad hand in life, however how they play that hand can determine how the game ends. We don’t always get to choose our cards, but we get to choose how we play those cards. What I took away from this book is that my current situation is an outcome of the choices I have made both good and bad. My life is a reflection of my choices. There are some choices I regret making and some that bring me joy, however, every single one of those choices lead me to this exact moment. To remove or change any of those choices would certainly change the movie. While this idea may explain why many people suffer from depression and have regrets do to their past choices, it also gives us hope in understanding that with every new day comes an opportunity to change our future. Understanding the power choices have on our lives makes me take pause. The good news is, if you don’t like where your life is going, you don’t like the script you can change it! With one little choice your entire life can be set on a new path. When I look at my children, especially my babies, the joy, thrill, and new expectations they have for every single day, it becomes clear to me on what I could experience with every new day. Waking up every day with no regrets from yesterday, because today will bring new opportunities, new choices, new direction, and a chance to course correct can be liberating and freeing! There is freedom in knowing that life offers us new chances every single day to get it right. In order to fully enjoy this gift you must be mindful in your present moments. Taking each and every choice seriously and using great thought. To take a choice for granted can be detrimental, because that choice may ultimately be your last choice. Here is another analogy (for those that love analogies). It’s like a game of chess, you have many choices in the beginning of the game, but with each choice comes either more choices or fewer choices. As you continue to play, if you continue to make bad choices, one of those moves are going to be your last moves because you will have nowhere else to go. That one move became your fatal move your last choice. Knowing and understanding this, you must be direct in your choices. One more analogy! Life is a journey. We are going along for the ride and on the road we will come to lights, stop signs, crossroads, and many other traffic situations that require us to make a choice. 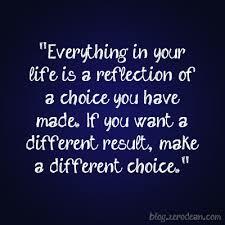 How we choose, and what we decide to do will ultimately determine our destination. If you can make conscious choices while enjoying the journey, life will certainly be good.